Maybe you’ve never heard of Flocon Inc., in Woodstock, but there’s a good chance you’ve seen their work. Take a look inside this growing firm and its strategy for staying globally competitive. If you’ve ever pumped a bottle of lotion, pushed the nozzle of a spray bottle or written with a paint marker, you’ve used a fluid applicator. And if you’ve ever touched up the scratch on your car or furniture, or sprayed some all-natural liquid onto your hands, you’ve likely used an applicator built in McHenry County. For nearly 30 years, Flocon has remained a silent, but critical partner in the ability of companies to bring their products to market. Just how extensive is this family-owned company’s reach? Its products currently cover some 75 percent of the automotive touch-up paint market. Its applicators are approved for nearly every aircraft serviced in the western hemisphere. And it’s a growing partner in the movement toward all-natural products. It counts on two continents. What’s perhaps even more amazing is that, for three decades, this family-owned firm has competed nose-to-nose with its Asian counterparts – and no less than 90 percent of the parts in the firm’s products are produced domestically, with many suppliers located within two hours of McHenry County. 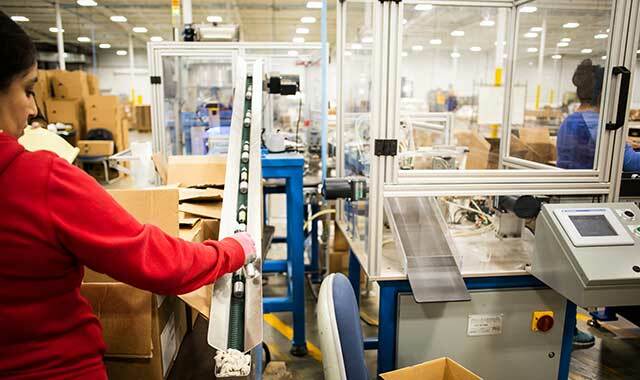 Even as it embraces automation and technology, Flocon is aggressively investing in its home base and the diverse workforce available in the northwest suburbs. Stephan M. Ballot, vice president of Flocon and son of company founders Richard and Patricia Ballot, shows off one of several automated systems inside the company’s sister plants in Woodstock. The conference room of Flocon’s headquarters is filled with examples of the company’s work. Some items look familiar, though out of place – felt nibs for markers, a colorful array of plastic marker caps, what looks like small brushes for fingernail paint. Some items are quickly identifiable – boxes of Tide To Go pens, Minwax touch-up markers, auto touch-up paint from the likes of Ford, Chrysler, General Motors, Honda, Toyota/Lexus and Subaru. Then, there are the brand names with specialized products, whose packaging looks very familiar nonetheless: all-natural bug sprays, organic spray-on deodorant, organic lotions. Flocon has found its niche in precision-engineered, high-performance, reliable fluid dispensing devices that can serve a wide range of industries, including household and personal care, automotive, aerospace, electrical and industrial. Its longest-running market, and its deepest penetration, is in the automotive sector, where its applicators serve most every major auto producer in North America. The company won General Electric’s locomotive division last year. Ballot expects to add both John Deere and FedEx this spring. Currently, Flocon maintains some 5,400 SKUs in automotive alone. Flocon’s work is no less impressive in aerospace, where its applicators have airframe approvals for most every aircraft currently in flight, Ballot says. Common uses for Flocon’s applicators include coating metal exteriors during airframe repairs, sealing rivets, repairing electronic circuitry and installing fuel tanks. Most of these products are made in conjunction with a chemical manufacturer who needs a method for their product to reach market. Ballot grabs an example of one product. It looks like a giant permanent marker with a round plastic shield. “It’s designed to survive a 50-foot drop, so even if it’s being used on the tail of an aircraft and it drops onto concrete, it won’t break and spill,” he says. While many of these items may look pretty basic, looks can be deceiving. The amount of technical engineering and testing that go into these devices can account for nearly three years of careful research and development. Why invest so much into the packaging and dispensing? Because those simple devices have a major influence on the way consumers experience the product inside. Ballot sees it first-hand with his wife’s skin care products. For a long time, fluid products were made entirely from synthetics, and it was easy to predict how those manufactured chemicals would behave. But now, with the rise of all-natural products and more water-based ingredients, consistency is a difficult target. “A natural product can vary from batch to batch and year to year, based on a number of factors,” says Ballot. “The unit we delivered was made to a standard that can accept a wider variance in fluid composition and consistency, so that it delivers a very consistent mist of product,” he adds. Augers feed parts into an automated systerm where Flocon’s fine mist sprayers are being assembled. Product inspection is built into the line, in order to remove defects. The research and development lab is pretty quiet today, save for a faint buzz in the corner. That noise is the sound of a Flocon sprayer and bottle enduring a temperature endurance test. Most days, the 3-D printer is also spitting out prototypes and the plastic injection molds are popping out sample bottles and components. Long before it reaches this room, a product goes through a rigorous process of ideation and conception, assessment and engineering. It’s this latter part, engineering, where Flocon stands out. 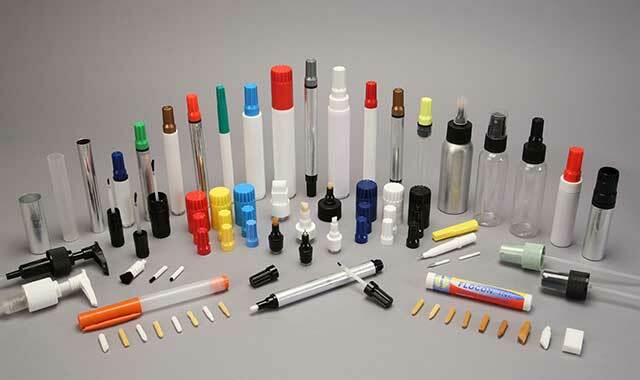 Its design and engineering team boasts, on average, more than 30 years of experience in dispensing applicators. Ballot lists off a few accomplishments from his design team’s past: A combined 80 years with two of North America’s largest dispensing mechanism companies, packages for the likes of Elmer’s glue and Kraft Foods, products under the CVS drugstore label, work with Arm & Hammer as well as Honda’s motorcycle division, and engineering the original Swiffer product line. “It’s nice we have a very mature team of veterans, and we’re also developing the next generation of members on our team, as well,” Ballot adds. From engineering, a product enters the prototyping, development and testing phase, which happens largely in Flocon’s R&D lab. This process alone may take several months, as the team assesses product performance in a variety of conditions. The entire development phase may take two or three years, and that’s by design. In some cases, a new product may be an entirely new, ground-up design. In other cases, it may simply involve a variation on an existing product line – perhaps something that’s a little larger or made from different material. In one corner of the company’s Woodstock headquarters, a single assembly room can handle some 19,000 configurations per year, says Ballot. Dividers separate each part of the process, in large part to prevent mix-ups. Flocon’s six facilities manufacture and assemble its products, with some locations also providing filling services for clients. Sister buildings in Woodstock handle corporate functions, research and development, assembly, labeling and packaging. A Harvard site handles product decoration as well as injection molding. A site in Frankfort handles filling services and warehousing. A site in Scotland handles filling services and packaging for the European market. It was pure luck that Ballot’s parents, Richard and Patricia, entered the fluid dispensing game in 1989. Richard, formerly from the publishing industry, and Patricia, a former cookbook editor, had their sights on a food-related business when they came across an intriguing opportunity. The product in question had been in development but had yet to make it to market. Once they acquired the technology the couple finished development and started selling it. At the time, they faced stiff competition overseas. “There were a lot of people who thought my parents were absolutely nuts jumping into a product line in the world of manufacturing where their very first market was dominated by companies in Japan,” says Ballot. As his parents started the fledgling company and his mother balanced part-time work in the food industry, Ballot maintained a part-time presence at the company. Of course, he was also juggling college and a non-related career. In 1997, he became the company’s second full-time employee and started working alongside his dad. From its first location, a 660-square-foot office to a series of ever-larger complexes, Flocon continued to grow. Last summer, the business moved into a pair of buildings in Woodstock – the former Brown Printing and a next-door neighbor – that together encompass some 670,000 square feet on 58 acres. Richard and Patricia still are an active presence on campus. Their other son, Richard, maintains the family’s operations in Harvard, a separate company that supplies injection-molded plastic to Flocon. That plant holds 57 injection molding presses that operate around the clock five days a week. Auto touch-up pens are fed into this machine, where they’re mechanically arranged, inspected and packaged. Computers log data along the way. The highly automated system is whirring away, assembling a dizzying line of fine mist sprayers. Robotic systems are spinning, rolling, inspecting and moving parts as two employees feed the machine and cart away boxes of finished sprayers. This line, like almost every other automated system inside Flocon, contains built-in inspection mechanisms to help reduce errors. Ballot calls it a pursuit of “zero field failure,” and the point is to minimize the potential for a bad user experience when this product reaches the end user. “It’s going through a series of tests, where it positions the part at different openings, and it measures air pressures, the amount of pressure required to open it, so we can be reassured that when this hits the market, everything is fully functional,” says Ballot, showing off the machine. By his side is a bin half full of parts that didn’t pass inspection. Another nozzle drops down the chute. “It takes a long time and a lot of money for someone to get a customer, but it can be very easy to lose one,” says Ballot. Thus, why the packaging for automotive touch-up paint can get so complex. 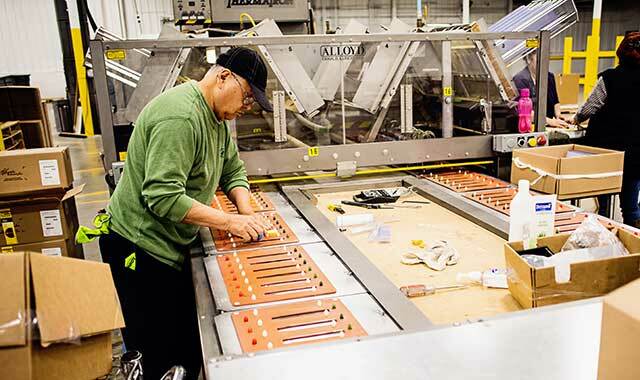 At one end of the packaging machine, a conveyor feeds touch-up pens into the system. Each is quickly scanned and reoriented, so that a specific part of the label is visible to the consumer. This machine is accurate to within 2 degrees, Ballot says. Before the pen is packaged, a small barcode on the cardboard pack is scanned, to ensure it’s the right box for the job. A computer built into this system is recording every barcode. “If the customer reports an error, we can go back and analyze that data,” says Ballot. Quality control is a major driver of automation for Flocon, but that’s only part of the story. It’s also a matter of remaining competitive. In the case of that packaging system for touch-up pens, automation enabled rapid business growth. Just around the corner from the packaging machine, workers are gathered around three tables where they’re assembling auto touch-up pens. Someone at the lead fills the pen, then passes it to the next people, who assemble the caps and snap it all together. Each station designates a different “generation” process, each one a combination of automation and manual labor. The setup is essential for speed because each order may include just 120 units – too few to make full automation affordable, says Ballot. In a given day, this team may produce 55 distinct colors, taking just 10 minutes to turn over the line. Ballot says he’s occasionally shelved automation systems that didn’t make sense, and he’s repurposed others where needed. In one dark, isolated corner of Flocon’s new Woodstock assembly center, Juan Lopez is manning a beastly machine that’s capable of doing an entire bottling run from start to finish. It was designed to handle up to 20,000 units of a particular color at one time. But most runs are only around 120 units, and it takes a full 20 minutes to change the line. The economics just don’t work. 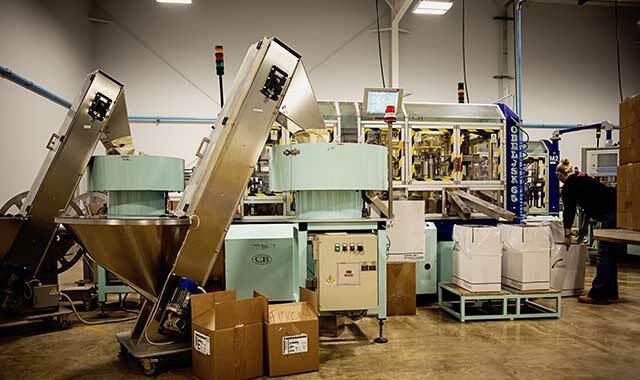 “This line, every 8 hours, can produce about 50,000 sets, so what we’ve done is repurpose it so that, instead of doing everything on this device, we do only the things that are needed for this particular bottling run,” Ballot says. Gears are pushing, punching, swiveling, running bottles of automotive clear-coat around the line. The machine periodically stops, and Juan addresses the holdup. Ballot says Juan is one of the most accomplished machine operators on the team, and his degree in mechanical engineering makes him especially qualified for the day-to-day maintenance of this machine. “It takes such a high talent level to run this, and if something happens, it takes two people to troubleshoot, sometimes,” says Ballot. Throughout Flocon, flexibility is a prime attribute. With less than 200 employees across five plants, the company maintains a lean operation where employees typically fulfill multiple roles, Ballot says. Across disciplines, in both the office and the plant, he emphasizes communication, respect and a willingness to move the company forward. This machine, which once packaged batteries, now packs up markers for furniture touch-ups. It came from a firm in DeKalb, just one of many area firms supplying Flocon. If there’s been one constant at Flocon, it’s growth. This past summer, the company completed its latest move, relocating from Cary to the eastern side of Woodstock, into a pair of properties that took nearly three years to bring online. Over the next 18 months, the company plans to launch three new products. One is a new type of lotion pump set to roll out this spring. The other involves a joint effort with a company in Japan. The product, which Ballot says is being tested in select markets, involves two assemblies that snap together. It comprises six domestic and international patents. Where Ballot really eyes growth opportunity is in mass customization – the ability to work off a standard platform, like a lotion pump, and customize certain aspects depending on each client’s needs. Such an approach allows the firm to remain flexible and competitive, Ballot believes. In moving Flocon to its new site, the company did entertain other locations around the country, says Ballot. In the end, it made more sense to stay in McHenry County, rather than uproot employees and disrupt the supply chain. Walking around the Woodstock plants, Ballot can point to multiple reasons why it’s been advantageous staying in Illinois. 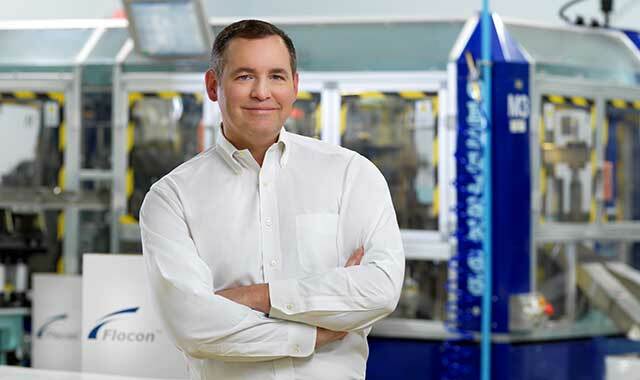 Besides the machine producers in DeKalb, and the robotics and automation teams he’s found in Rockford and Elgin (among other locales), Ballot and his team have tapped into a rich supply base. On one kind of auto touch-up paint, 26 of 28 components all originated within two hours of Woodstock. One customer’s plastic sleeve packaging originates in Sparta, Wis., midway between Madison and Minneapolis. It gets printed in Waukegan, foil stamped in Madison and die cut in Addison. It’s not just the supply base that helps. Chicago is a crossroads of transit. In seeking new sites, Flocon was in contact with multiple states, says Ballot, but taking taxpayer incentives – to go or to stay – was never in the cards. This entry was posted on Tuesday, January 29th, 2019 at 12:00 pm	and is filed under Northwest Business Magazine, Top Posts. You can follow any responses to this entry through the RSS 2.0 feed. Both comments and pings are currently closed.